Panel Processing Inc. has 10 manufacturing facilities in six locations, including Alpena, Holland and Coldwater, MI; Merrillville, IN; Jacksonville, TX; and Eufaula, AL, with a total of 850,000 square feet of manufacturing and warehouse space. The company has created redundancies throughout its various facilities to maintain short lead times during peak periods. Panel Processing Inc. successfully combines customer service, technology and a willingness to explore new avenues of growth to serve as arguably the largest panel fabricator in North America. Panel Processing Inc. implements the latest in equipment and technology and has built redundancies into its manufacturing process with one goal in mind: to make sure the customer is happy. 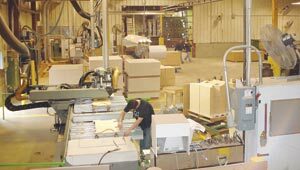 In 1971, Bob Granum founded Panel Processing Inc. because he saw the need for the intermediate processing of hardboard. After hearing many customer requests for the painting, cutting and perforating of their hardboard panels, he stepped up to fill a niche in the market. Since its beginning at a single plant, Panel Processing Inc. has grown to encompass six locations and 10 manufacturing facilities, making it arguably the largest panel fabricator in North America. The company has a total of 850,000 square feet of manufacturing and warehouse space and employs approximately 340 people. The company's continued growth is due to a number of factors, such as: constantly updating its technology, seeking new avenues for business and its overall philosophy of making sure the customer is satisfied. After that, everything else seems to fall into place. According to Empfield, the company will work closely with its customers to conduct value engineering, help coordinate projects, work with lead times and supply large rollouts in a short period of time. Founded in 1971, Panel Processing began as an intermediate processor of hardboard. With the boom of mass merchandising, the company expanded into other areas. Today, the company has grown to six locations with 10 plants. 1. The company has built a reputation of putting customer service above everything else. 2. Redundancies are set within the company's manufacturing capabilities, enabling large rollouts to be completed quickly without affecting small- to medium-sized orders. 3. Panel Processing utilizes the latest technology to maximize productivity, decrease lead times and maintain its standard of quality. Panel Processing Inc. is able to maintain that reputation, in part, because of redundancies that are purposefully built into the system. Across its many manufacturing facilities, one will find some of the same processes and equipment at Panel Processing. These redundancies are built into the system to give the company more flexibility during its peak periods and complete large projects quickly. Panel Processing Inc. completes and ships most jobs within two weeks, according to Empfield. For instance, each plant in the company has two to four punch presses, made by South Bend, and two to three Schelling panel saws. Depending on the size and nature of the order, Panel Processing can complete several hundred jobs per month. The redundancies help the manufacturing process remain flexible, Empfield says. Additionally, each plant will normally stock about 3 million square feet of board in various thicknesses, widths and types of materials. âWe stock a huge amount of board so that we can react quickly when orders come in,â says Empfield.